Back in August 2010 I received “The Knitted Rug” by Donna Druchunas for my birthday. I was super excited, because I’ve wanted this book forever. Since I suffer from knitting ADD I immediately got started. I don’t know about you, but I tend to have yarns in my stash that were gifted to me or that I bought in a moment of knitting weakness and now wonder what I will ever want to do with them. My conclusion was I would turn them into a rug. I searched through the book and fell in love with the spiral rug. This rug violates several of my knitting rules, 1) It requires a copious amount of seaming, 2) It is rather boring, just garter forever, 3) It is a lot of knitting – Evidence against a lot of knitting a) I’ve never even knit an afghan, b) After my last baby blanket I swore never again, c) I often get bored knitting a scarf, d) I haven’t finished a sweater in years. Despite this I decided this was the rug for me. Fast forward to February 2011 and I’m finally done. All spiraled out. The knitted strip for this rug is 97 feet and 2 inches long! Well, sort of done. At this point I’ve finished knitting and weaving in ends (done after the picture was taken). But that still leaves the seaming. However, I’ve managed to pull a rabbit out of the knitting bag! 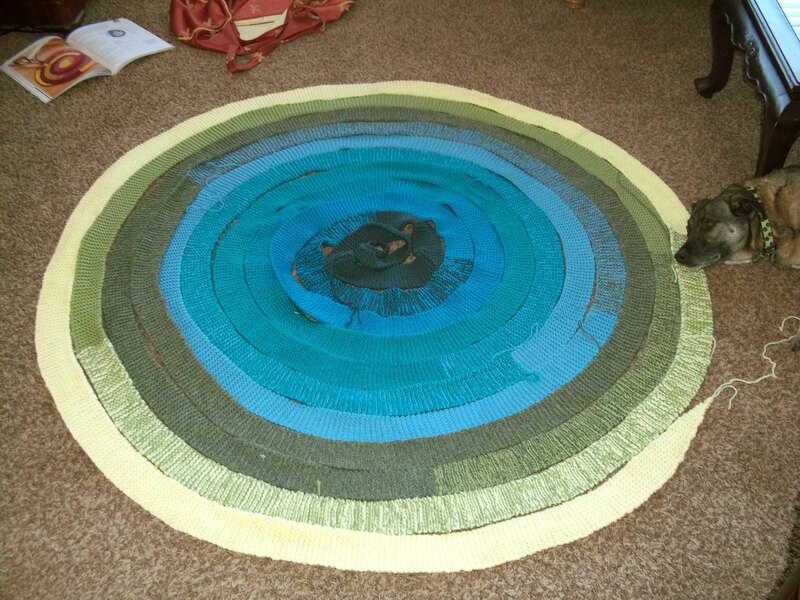 I now have 24-hour access to a sewer who has agreed to seam this rug! Hallelujah! Knitting miracles do exist! All in all, I’m pretty pleased with this rug. It used up a lot of yarn that I wouldn’t otherwise use. It is machine washable. It’s really bright, which works, because I have a painting that it coordinates with perfectly. And I also think it’ll work well with the pillows we just made for the TV room. I will try to remember to post a finished picture once it’s seamed. It will be slightly different from its currently layout. The pattern calls for wool and a lot of blocking to get the center to lay flat, but, since I wanted to do some stash busting and be able to wash the rug, I didn’t use wool. So, I imagine the center won’t lay flat. You can see how ruffly it is. To combat this I decided to knit a center strip and we’re going to seam it as an oval. Hopefully, it’ll look cool. Fingers crossed. Have you ever knit a rug? How did it turn out? And has it proved durable? I would put it on your bed. wow, good perseverance. I love your colours too. I have started a similar one but you seem as you go by picking up and the circle has short rows to make it curl a bit more. I like yours too, plus with the short rows it will actually be round. 🙂 I always worked on it when I needed mindless knitting. I kind of miss having it to work on. I am quite impressed. Good for you that you found someone to seam it up for you. That alone would probably get it back in my ‘need to finish’ closet. I can’t wait to see the finished rug. Be sure to post again when you get it back. Job well done. Its my out and about project that I work on in the doctors and in the car etc. it’s basically 22 garter stitch squares which you then join together and then felt.